The 31-year-old singer has been approached by TheBigandTheBeautiful.com, which is "specifically designed for women with curves", reports TMZ.com. It seems the person who runs the site, Whitney Thompson, the first plus-size winner of TV show America's Top Model, is willing to pay Christina three million dollars to be their spokesperson, which would apparently include photo shoots and public appearances. 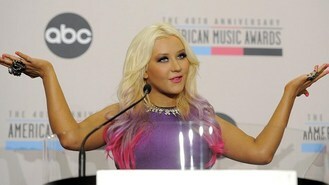 Christina's response isn't known, but the star has previously been outspoken about embracing her womanly physique. The mum-of-one recently revealed that she has told music bosses to accept they are "working with a fat girl". The Keeps Gettin' Better singer said she was tired of conforming to someone else's ideal body image and that when she started working on her new album Lotus, she decided to make it clear that she is in control of her own body. "They need a reminder sometimes that I don't belong to them. It's my body. My body can't put anyone in jeopardy of not making money any more - my body is just not on the table that way any more."